Live updates as the Bruins face the Toronto Maple Leafs on Thursday, April 3. Let's not forget one thing as this story unfolds; the Bruins are damn good. Just now, another Merlot line vs.Bozak line shift; #Leafs ice puck w/3 minutes left in tie game with #NHLBruins . #Bruins going to the PP with 1:14 to play in the 3d. Kuleman held Lucic as he burst into the Toronto zone. Milan Lucic draws a holding call putting the Bruins on the power play with 1:20 left in regulation. And our NESN plus feed goes out. Wheee! And everyone's NESN plus feed goes out. Good job, good effort! From multiple hits on 1st shift to his goal at 5:03 to drawing late penalty vs. #Leafs ' Kulemin, great 3rd pd. for #NHLBruins LW Lucic. Well at least NESN is showing commercials. Progress, right? End of the 3d period, #Bruins and #Leafs tied 3-3 and headed for OT. Furious period by the B's, outshooting Toronto 17-5.
.@RealJackEdwards "The technical side is on the Canadian side of the border. Must be something with the exchange rate." Hey everyone wanted to see TSN's video feed with Jack and Brick calling the game, right? You're dream has now come true! Bozak FINALLY demonstrates how pushing a bit, driving hard to the net, can produce a positive result. Leaf pp at 1:52 of OT. And the NESN feed is back. The world is not coming to an end after all! And of course NESN comes back just in time for Kadri's game-winner. Good night, Twitter! Kadri! Whoa, wouldn't have picked him. 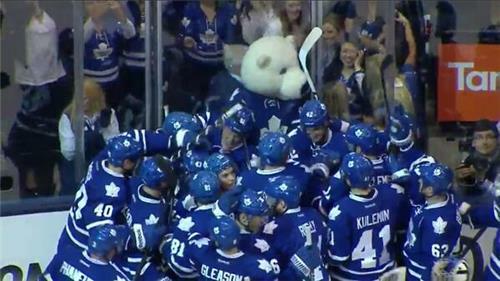 Mathematically still alive are these Leafs with a 4-3 OT win. 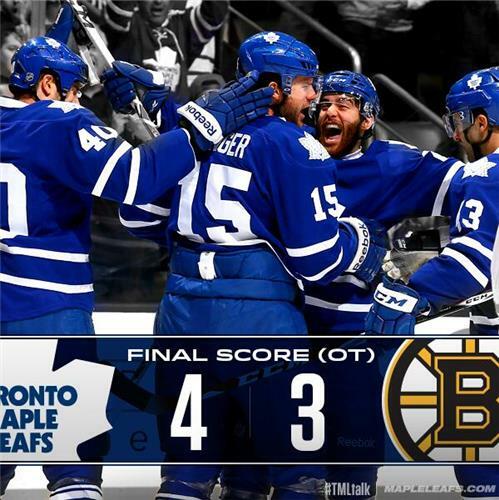 #Leafs take the W in overtime, Kadri scores the PP goal to send the #Bruins to their second straight loss. And everybody in the building leaves feeling good for James Reimer. Easy to believe #NHLBruins are 7-13-3 when trailing after 2nd, which is pretty good. Hard to believe #Leafs are now 26-1-2 w/lead after 2. IMO, worst part of the finish was that #NHLBruins D Krug made such a strong 1-on-1 play vs. #Leafs ' Bozak, and took a penalty. Wrong call.